You're in the loop for The Wizard of Oz! We'll email you before tickets go on sale in your area. Get email alerts and never miss an onsale for The Wizard of Oz! 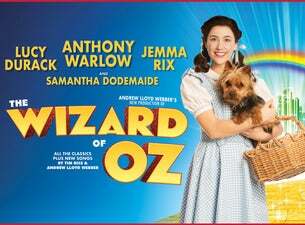 Starring Anthony Warlow, WICKED’s leading ladies Lucy Durack and Jemma Rix and rising star Samantha Dodemaide as Dorothy, The Wizard of Oz is an enchanting revision of the all-time classic. Developed from the ever-popular MGM screenplay, it contains the beloved songs from the Oscar-winning movie score, all the favourite characters and iconic moments, plus a few surprises along the way, including new songs by Tim Rice and Andrew Lloyd Webber. Don’t miss your chance to rediscover the real story of Oz in this fantastic musical treat. Which The Wizard of Oz event are you going to?